Over a decade after its release, the first Fox movie perhaps stands up better than you might expect. It was never deep or meaningful, and contains a vapid MOR white rock soundtrack, but it perhaps feels more like a Marvel superhero movie than it did back in 2005. At the time, it was seen as a goofy, jokey piece, and, with elements like a poodle covering its eyes while about to crash, and Reed stretching for toilet roll – still a low point for the group in movies – then its humour is, to say the least, obvious. However, now the Avengers are on screen with somewhat smug, predictable “instant reversal” humour and Chris Evans is acclaimed as Captain America, it almost feels like the real thing when you see a younger Evans as Johnny Storm. It’s somewhat troubling that Johnny is so much physically larger than the rest of the cast, which throws away his “kid” status, but the main foursome aren’t too badly depicted, and they have a reasonable chemistry for a first movie. Jessica Alba remains the weak link of the four, as she gets little to do other than appear in states of undress, not the only female character to do so in a film that’s more than lightly sexist. Doctor Doom has, of course, yet to appear on film as a diplomat from Latveria, and the closest he’s come to the comic version has been, tragically, the unreleased Roger Corman movie. 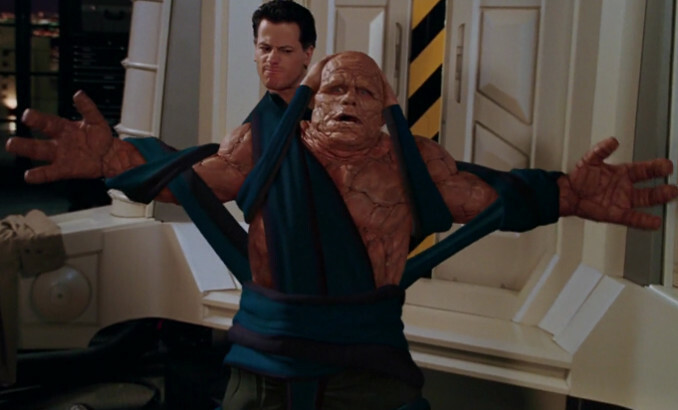 There’s really no reason why this should be, and while some changes to the characters are perhaps necessary for cinema audiences, it does appear that Fox are embarrassed of the group’s more pulpish origins, the latest attempt to bring them to screen not even seeing the name “Fantastic Four” spoken in the film. This version does, at least, make some attempt to embrace it, even though it still makes pains to mock the more outlandish concepts at its core. Although the premier Welsh superhero of the year was Christian Bale in the first Christopher Nolan Batman movie, Ioan Gruffudd makes a likeable, socially awkward Reed, and the picture actually outperformed the admittedly superior Batman Begins in terms of recouping back its expenses. (Although the FF movie’s box office of just over $330 million was just over $45 million less than Batman’s, the DC movie had an extra $50m on its budget to play with). The movie, made on just $100 million, is, of course, far too cheap for a movie of the FF’s requirements, and even at the time it looked incredibly shabby in places. They try with the Thing, but it does look like a man in a suit, and the special effects for Reed’s powers are exceptionally poor in almost all instances. The film was successful enough to merit a sequel, and although Rise of the Silver Surfer had an extra $30 million to play with, the rate of interest in the two year gap meant this still amounted to less than an extra $23m granted to the movie. The film is fast-paced (they gain their powers within twenty minutes of screen time) and has a form of good-naturedness about it that manages to avoid outright cynicism. 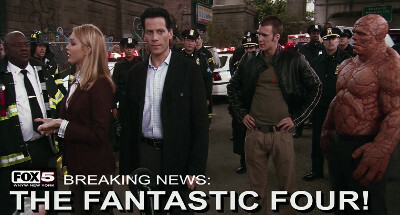 As the owner of a Fantastic Four website, I naturally tried to view the film charitably when it was released, and gave it what now seems a ridiculous 4/5 score way back when it was released. The reality is, it’s more of an average film at best, prone to crass exposition, and without the full confidence to respect its own worth. Yet at the time Marvel was still to make a truly successful film under its own studio banner, and the idea of a film where Chris Evans took part in a battle with Spider-Man, Ant-Man and the Black Panther was then beyond belief. In the present day it’s easy to look back with mild derision on this attempt to bring the FF to the big screen and wonder why it seemed so ashamed of itself, or why there wasn’t more money thrown at it. But the benefit of hindsight places us in a market where even lower-tier and more outrageous characters like the Guardians of the Galaxy are box office gold… even as recently as 2008 it was possible for an A-list character like The Hulk to star in a film that struggled to recoup its investment. With this in mind, then maybe The Fantastic Four was the best it could have been, if not the best that the comic deserved.